The premise for Oculas is promising; Brenton Thwaites and Karen Gillan play Brother and Sister Tim and Kalie Russell. We first meet Tim as he levels a gun to the head of a young girl and fires. This we find is a recurring nightmare that he has over the death of his mother and father. After years of therapy in a secure mental institution he is now cured and now believes that it was his father who was the real evil in his life and not some supernatural force at work. Just as he's being released his sister is “borrowing" a three hundred year old mirror from the auction company that she works for. She then has it transported to the family home, where years ago her father killed her mother and Tim killed his father. Kaylie believes that it wasn't her father’s fault, but that he was possessed by demons that came from within the mirror. The pair we find have had a bond since childhood that they will kill the unholy demons that haunt the mirror. But before they carry out their promise Kaylie wants to clear her father’s name and document and prove that the mirror is possessed. Much to Tim's concern, he doesn't believe in the power within the mirror, the pair then install the mirror in their fathers old office and set up various devices that are there to warn them if the supernatural force enters the house. This includes cameras, alarm clocks, temperature gauges, and even a giant swinging blade designed to finally destroy the mirror. Once we know the back story Oculus cuts back and forth from the present day to the pair’s childhood. We watch as their father Alan ( Rory Cochrane) and mother Marie (Katee Sackhooff) both descend into madness and the children, who appear to be strangely unaffected by the demons who are running a mock in their beautiful home, are left to fight off their parents who are hell bent on causing them harm. Oculus could have been good fun but the limited story is so stretched that you get the feeling that it would have been better suited to a short film. As the film progresses the flash backs become more frequent and confusing. 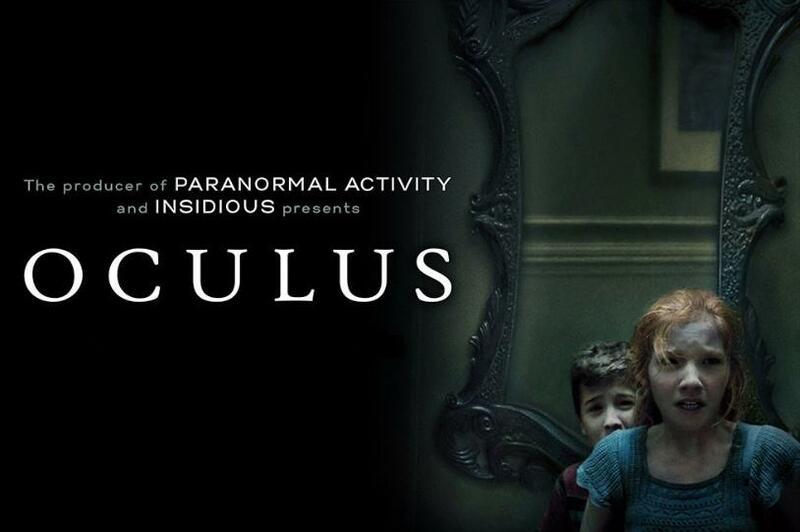 The biggest problem with Oculus, and it's a huge one for a horror film, is that it's just not very scary. It's given nothing away to say that the ending sets up the story for the inevitable Oculus 2. I can hardly wait.